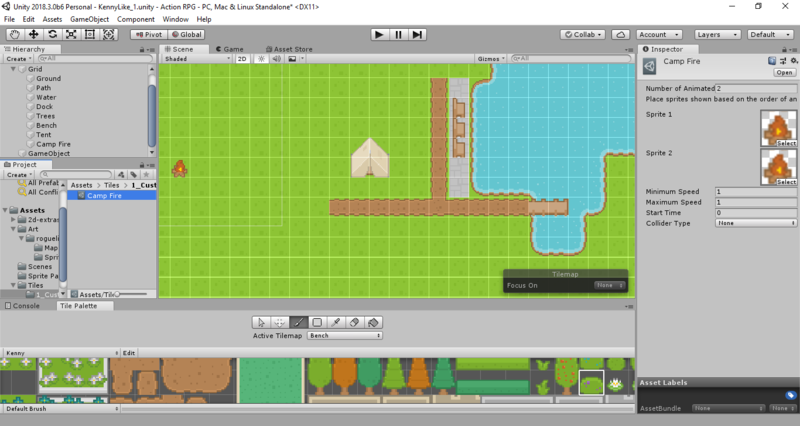 I just wanted to share how to animate a tile for a tilemap. If you already know how to do that great job, If I am making this process more complicated than it should be please let me know. 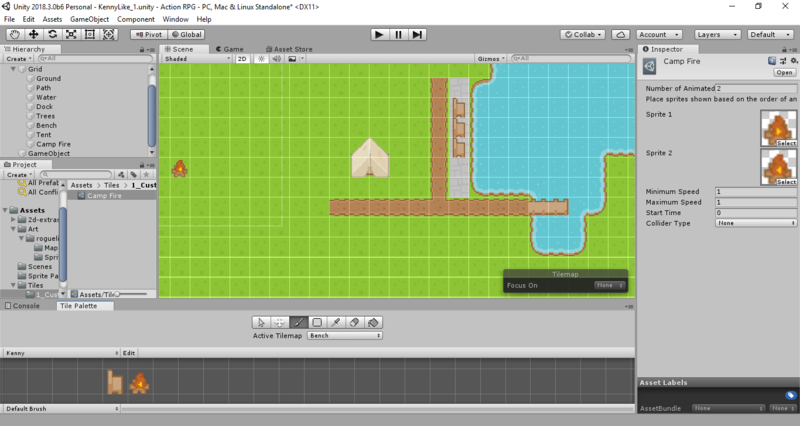 Okay, so I knew that the new beta version of Unity had the ability to animate tiles for the tilemap feature but I was unsure how to do it. After doing some digging I found out a few things. First, I had to download some code from GitHub to enable the features and second you had to make a special tile called an Animated Tile. I will be using the campfire sprites from the Roguelike RPG Pack that Kenny has bestowed upon us. That asset pack can be downloaded at the following link https://www.kenney.nl/assets/roguelike-rpg-pack or you can just download the two sprites we need right here. Open Unity and add the unzipped 2d-extras file folder to the assets folder of your project. After adding the file folder give it a few seconds to compile. When the loading bar at the bottom goes away you should be ready to use your new feature. Open up the inspector for your new Animated Tile. Add the first campfire sprite to Sprite 1 by pressing select and locating the sprite. Do the same for Sprite 2. 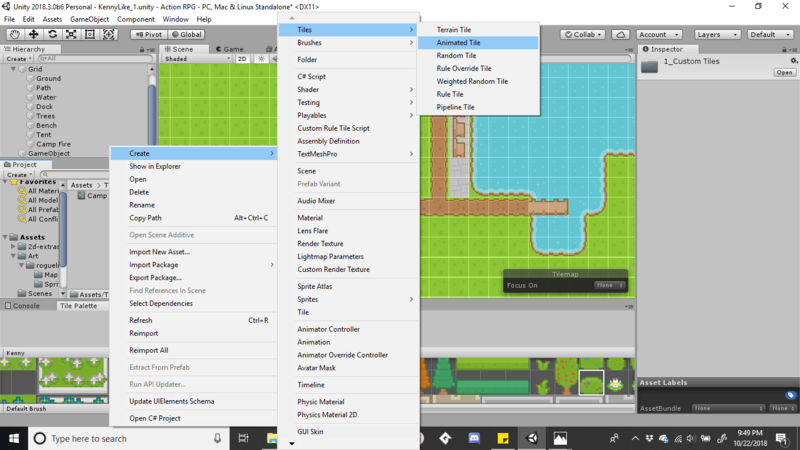 Add the newly created and edited Animated Tile into your Active Tile Palette by dragging the Animated Tile from your assets to the Tile Palette. Paint your new campfire tile into your scene. Press play and watch the fun begin. 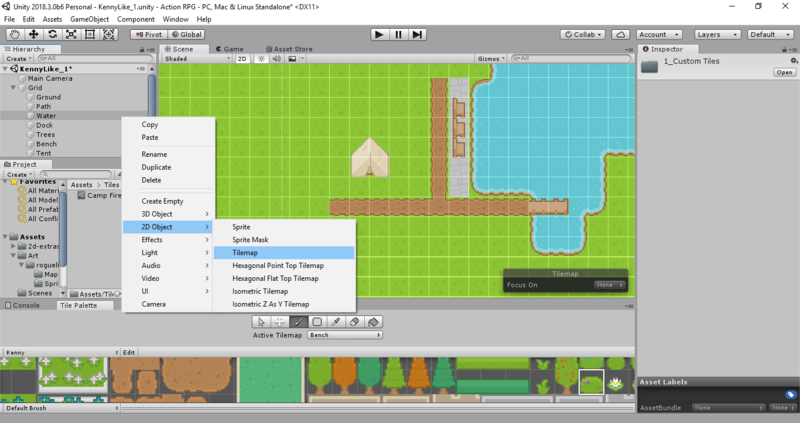 If your animation is to slow then you need to click on the Tilemap in the Hierarchy and adjust the Animation Frame Rate. In this example, I am using 5 as the rate.